Of all the nostalgic franchises that have gotten a big screen reboot, Power Rangers was probably one of the harder ones to adapt. This series has always been ridiculous, campy, and even stupid, but that’s what fans seem to like about it. When it comes to superhero movies, though, audiences today expect a certain degree of sophistication, even if our protagonists are teenagers with attitude. So how can Power Rangers remain faithful to its source material while still providing a timely update? Honestly, a project like this should be dead on arrival. Against all the odds, however, the filmmakers more or less hit their target. It’s certainly no Guardians of the Galaxy, but it’s about on par with Michael Bay’s first Transformers movie. This is pure popcorn escapism that knows what it wants to be. At least that’s more than can be said about any of the Transformers sequels. If you’re at all interested in seeing a modern interpretation of Power Rangers, you’ll have a morphin good time. If you’re at all interested in seeing a modern interpretation of Power Rangers, you’ll have a morphin good time. As you might’ve guessed, the film centers on five teenagers: Jason (Dacre Montgomery), Kimberly (Naomi Scott), Billy (RJ Cyler), Zack (Ludi Lin), and Trini (Becky G). Although these kids are all good looking, well dressed, and physically fit, the people of Angel Grove deem them as outcasts. After destiny brings these beautiful misfits together, they’re given the abilities of the Power Rangers. Their mentor is none other than Zordon, who looks like a giant pinscreen with Bryan Cranston’s face pressed in. Zordon informs the Rangers that the villainous Rita Repulsa (Elizabeth Banks) has returned. The Rangers must master their powers and learn to work as a team before Rita takes over the world! While the tone of the film is darker and more grounded than the previous incarnations, it never goes too far like Jem and the Holograms or FANT4STIC. Power Rangers still has plenty of bright colors and a refreshing sense of humor. The five leads all have strong chemistry and create enjoyable characters. Banks is clearly having a ball while Bill Hader scores a few laughs as the usually irritating Alpha 5. Cranston is an inspired choice to play Zordon, especially since he was on the original Power Rangers. Of course you probably never noticed this since he merely voiced Twinman and Snizzard. While there’s a lot to like here, Power Rangers does suffer from some pacing issues. The biggest problem is that the Rangers don’t really do that much crime fighting. 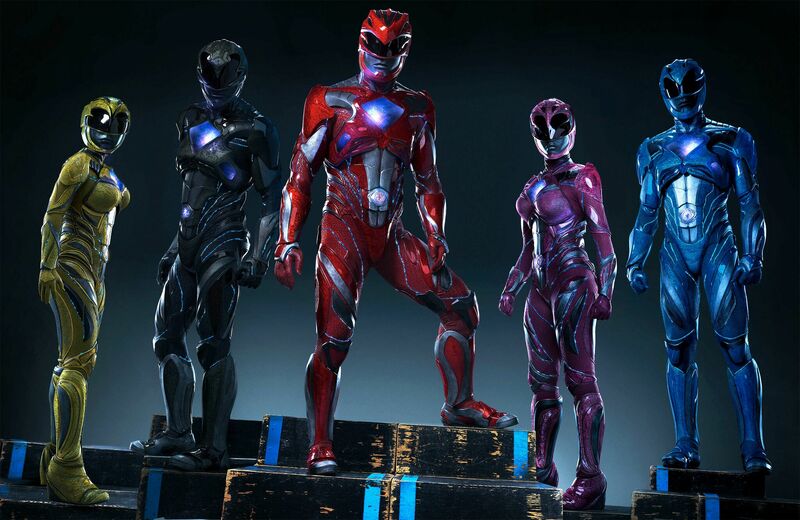 They don’t even morph and assemble their Zords until the final act. Granted, it’s clear that the filmmakers want to build up these characters before sending them into action. To be fair, we do get a little more character development than anticipated. When a movie is called Power Rangers, though, you want to see some big battles. This isn’t The Breakfast Club. While there’s a lot to like here, Power Rangers does suffer from some pacing issues. With that said, when we do arrive at the climax, the results are pretty kickass. We get to see all the Zords in action, including the Megazord. They even work in the original Power Rangers theme. There are also a couple choice cameos that will undoubtedly have diehard fans applauding. It’s just too bad we didn’t get a few more sequences like this. The film is admittedly uneven in areas. On top of that, there are several plot holes and the premise remains as preposterous as ever. For what it is, however, Power Rangers is big, loud fun with enough depth to keep us invested and enough fan service to leave audiences smiling. It’s far from perfect. If anything, it’s a guilty pleasure. But isn’t that what Power Rangers has always been to begin with? This entry was posted in Reviews and tagged Action, Adventure, Sci-Fi on March 23, 2017 by Nick Spake.